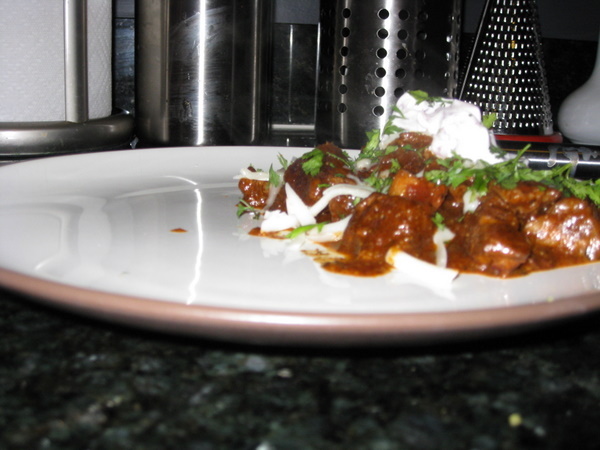 This is another America’s Test Kitchen recipe (I’m really not lying about my addiction), this time from The Best of America’s Test Kitchen 2009. It’s perfect for Adam and me, neither of whom like ground beef or beans in our chili. It has great heat, the right amount of spice, and lots of layered flavor. 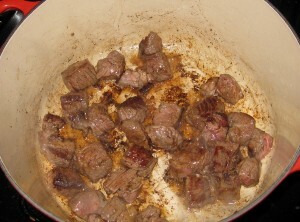 And great chunks of beef, which I prefer to ground beef and beans. Really good on a rainy night. I actually made the full batch of sauce, but I used half as much meat. I just got lazy when I made this last week, and I kept mistakenly using the full amount of ingredients when I was supposed to cut in half. So my version was saucier, but next time I will just cut the whole thing in half. I served it with yellow rice, and I sprinkled cilantro and a dollop of sour cream salsa on top. 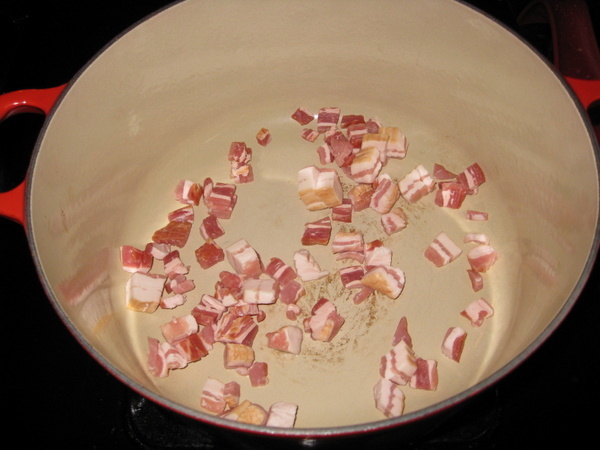 Cook the bacon in a Dutch oven (or large pot) over medium heat until crispy, about 8 minutes. Transfer the bacon to a paper-towel lined plate and save 3 tablespoons of the bacon fat. Meanwhile, pulse the tomatoes and chipotle in a food processor until smooth. Pat the beef dry and season with salt and pepper. 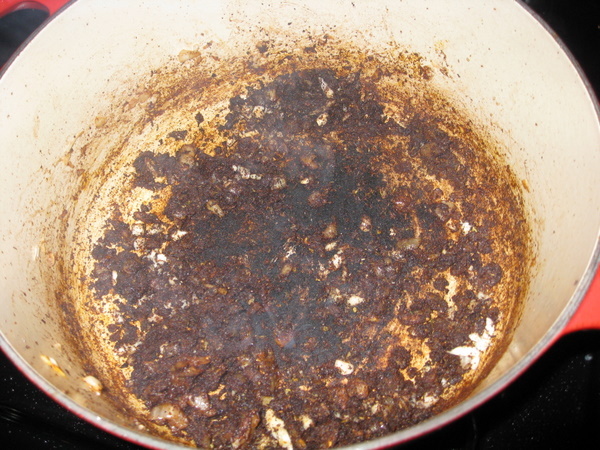 Heat 1 tablespoon of the bacon fat in the Dutch oven over medium-high heat until just smoking. Add half of the beef and brown, about minutes. Use a slotted spoon to transfer the beef to a bowl, and repeat this whole step with the other half of the beef. Add the last tablespoon of bacon fat, onion, and jalapeno to the empty pot and cook until softened, about 5 minutes (this is where I substituted some high quality chili powder, a couple of teaspoons of the mix Adam brought from Santa Fe). Stir in the chili powder (regular supermarket variety), cumin, oregano, and garlic and cook until fragrant, about 30 seconds. Stir in the water, pureed tomato mixture, bacon, browned beef, and sugar and bring to a boil. 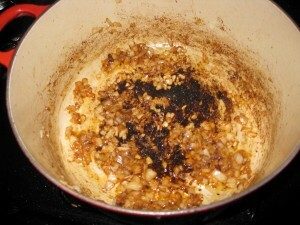 Reduce the heat to medium-low and simmer, covered, for 1 hour. 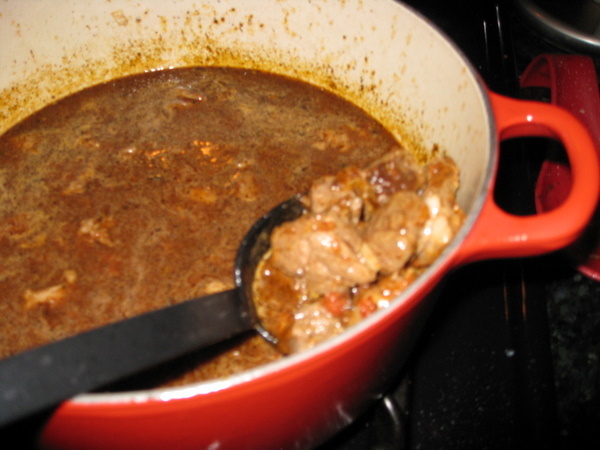 Skim the fat and continue to simmer uncovered until the meat is tender, 30 to 45 minutes. 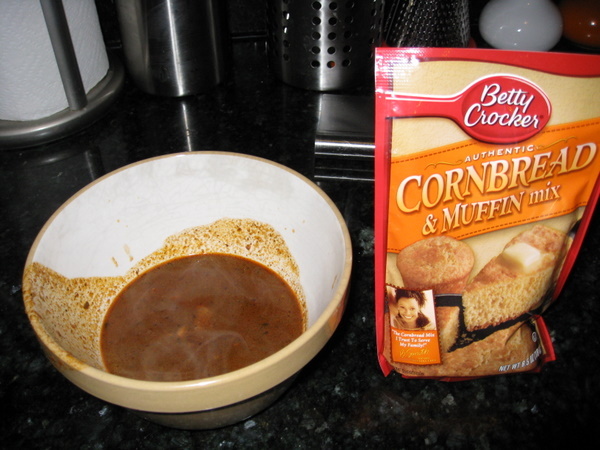 Ladle 1 cup of the chili liquid into a medium bowl and stir in the corn muffin mix. Cover with plastic wrap and microwave until it’s thickened, about 1 minute. 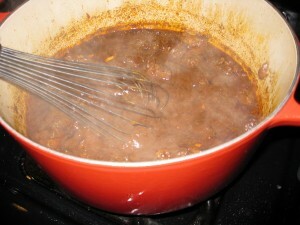 Slowly whisk the mixture back into the chili and simmer until the chili is slightly thickened, about 5-10 minutes. Season with salt and pepper and serve.